You gotta admit, that's pretty ingenious! This is truly a marvelous piece of engineering. it does not change, for every kilogram a boat weights, 1 liter water is pushed away, the lift always carries the same weight. They have something like this near where I live. At a place called Falkirk but that is more of a tourist attraction. #(removed comment) If you were do do as you suggest then the lift would be unable to raise your lead-filled boat. That is beyond the capacity of the lift. #10 The Scottish lift has less than half the lifting capacity of the Canadian lift. I would say that is a pretty BIG difference. Went through it with a group of canoeists... They aren't supposed to allow canoe's but we asked nicely! that's an amzing piece of engineering. I've been through old fashioned lockes before and they take forever!! this is so much faster and so cool!! #12 It sure is the Archimedes Principle at work here in that a floating object will displace it's weight in water, but your example is incorrect, the scale will add the weight of every tennis ball you throw in based on the fact that your tub is a closed container and the water has nowhere to go. 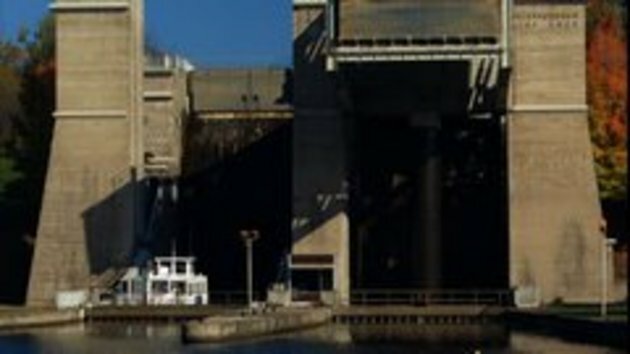 The lift lock however has a door that closes once the boat is in, so the displaced water is pushed outside the lift, thus making the lift weight the same every time. So your example only works if the bath tub is filled up to the brim and every drop of water that is displaced overflows, but who wants to clean up that mess in the bathroom after the experiment? #12 & #16 The difference between the English and German education systems is astonishing! #16 Explained and demonstrated that fact perfectly and correctly. What is truly amazing is when you stop to think that it was built 100 years ago and is still in constant operation. this is the best thing I have seen in weeks. in 1904 - thats amazing! That video has true snotr quality, very interesting!